If you’re a cord-cutter and you want to watch local TV channels on Roku, you’re not alone. Local TV channels like NBC, CBS, ABC, Fox, and the CW often air coverage of local sports games and events and provide local news. There are a number of ways to get your local TV channels on Roku, ranging from monthly subscription “skinny bundles” to OTA antennas, free Roku apps, and more. In this article, we’ll discuss the best options that you have for watching local TV channels on Roku. Let’s get started. If you’re interested in watching local TV channels on Roku, as well as cable news channels and networks like ESPN, a “skinny bundle” internet TV service may be right for you. Today, you can get a large number of cable networks, as well as local TV channels, with internet TV bundles like YouTube TV and DirecTV Now. Unlike cable packages, internet TV has no setup costs because you stream content using your existing internet connection. The prices are also flat and have no additional fees or costs – in most cases, what you see is what you get. The primary disadvantage of internet TV “skinny bundles” is that local TV providers must “opt-in”, in order to provide their content. Essentially, this means that your local TV coverage may vary quite wildly. For example, a fuboTV user in one city might get CBS/Fox/NBC, while a user in another city may only get one or two networks. This means that you should double-check each “skinny bundle” service below to make sure that they offer local networks in your particular area. There are a number of internet TV services that provide both local TV channels and cable networks, so let’s discuss your top options now. You won’t get any ABC networks at all, but you’ll be able to get NBC, CBS, and Fox in most areas. You can check out the full list of areas with local coverage here, on the fuboTV website. For your money, you’ll also get 70+ other channels that are mostly focused on sports, though there are some entertainment networks like FX and Lifetime. You can also upgrade to the $50/month fubo Extra package for even more channels. While fuboTV is expensive, it provides you with most local channels, and it’s a great choice if you’re a sports fan – particularly, if you like soccer. You can get started with a free 7-day trial now if you’re interested. Sling TV, owned by DISH Network, was launched in 2014 as the first American internet TV service, and it boasts millions of subscribers due to its low costs and “a la carte” business model. Sling TV has two basic subscription tiers: Sling Orange and Sling Blue. Both cost $25 and have different channels. Sling Orange, for example, has ESPN and ESPN2, while Sling Blue has Fox Sports channels. You can combine both packages for $40 if you want full channel coverage. To get local channels, you’ll need a Sling Blue subscription. This will get you access to Fox and NBC in select markets. To check and see if your local NBC or Fox affiliates are available, you can visit this website. However, you can’t get ABC or CBS, no matter where you are. Sling TV is pretty inexpensive if you just want Fox and NBC. If these channels are available in your area, the service may be worth it for you. You can give it a shot with a free 7-day trial at their website now and see what you think for yourself. Hulu With Live TV is a newer Internet TV service. Given that Hulu has close ties to NBC and Fox, as well as several other major broadcasters, it may come as no surprise that it has a huge number of network affiliates from ABC, CBS, Fox, and NBC – nearly 600, at the last count. According to the company, around 51% of all US households now have access to ABC, CBS, Fox, and NBC stations. You can visit this Hulu webpage to see if you’re one of them. The service costs $40 per month, and you get a number of benefits in addition to these local channels. You get a rock-solid channel lineup with cable news, entertainment, and sports from channels like ESPN and Fox Sports, with a total of around 70 channels. Not only that, you get a free Hulu subscription, so you can watch all of the movies, TV shows, current-season episodes, and Hulu Originals that are offered by Hulu – for no additional fee. There’s also the recently-added “Todo Y Mas” package, which is focused on Spanish-language broadcasting. The company has contracts in place with NBC, CBS, ABC, and Fox affiliates, so DirecTV offers live local coverage in most areas of the US, though the channels offered may vary based on your location. Find out what affiliates are available near you with this tool from DirecTV Now. Additionally, you can get up to 120 other top cable channels including ESPN, CNN, and more, depending on the cable package that you choose. Overall, DirecTV Now is a reasonable deal and offers most local TV channels on Roku for a good price. YouTube TV had its full launch last year, with a star-studded ad campaign during the MLB playoffs, and it’s a great choice if you want to watch local TV channels on Roku. For a subscription price of $40/month, you’ll get access to 70-80 channels in some areas, including Fox, NBC, CBS, and ABC. In most cases, you’ll be getting both local live TV coverage, as well as on-demand streaming of content from these networks. You can check this list to ensure that you will get all of the “big four” broadcast networks. YouTube TV is, overall, a great value if you want local TV channels on Roku. Not only do you get the “Big Four”, you also get great cable channels like ESPN, Fox Sports, NBC Sports, TBS, TNT, CNN, Fox News, and much more, as well as a fantastic unlimited DVR and the ability to stream your shows on 3 devices at once. PlayStation Vue has struggled to gain market share – perhaps because of its unfortunate name. No, you don’t need a PlayStation console to sign up or watch live TV – and you can watch local TV channels on Roku using the service. You’ll get local channels even with the least expensive “Live A Little” package, so you don’t have to worry about spending an arm and a leg. PlayStation Vue has ABC, Fox, NBC, and CBS in most – though not all – areas. If you can’t get your local channel, you’ll get on-demand programming from the respective broadcaster, so you won’t be able to watch local programs live, but you can still watch major network programming. By entering your ZIP code at the PlayStation Vue website, you can see which local TV channels you can watch on your Roku. Don’t want to shell out $25, $40, or even $60/month for an internet TV “skinny bundle” just to watch your favorite local sports or news coverage? The good news is that you don’t have to! You see, all of your local CW, ABC, CBS, Fox, and NBC channels are available to you – for free – as long as you have a piece of technology that’s often overlooked in the cable and satellite TV era: the humble OTA (Over-The-Air) antenna. You can connect an OTA antenna directly to your television and enjoy all of your local channels without having to spend a dime. All you have to do is check your location using a website like AntennaWeb, and hook up your antenna! If you want to watch local TV channels on Roku, you have a few options. You’ll need to download an extra app or two, but the end result will be the seamless integration of local networks into your Roku experience! If you want to record local news coverage, special events, or your favorite network shows, Tablo is the best way to do it. Tablo offers a number of different DVRs which can be used to record OTA television and stream OTA coverage directly to your Roku using Wi-Fi. This also allows you to fast-forward, rewind, pause, and record your favorite shows directly to your Tablo device. If you’re interested in Tablo, you can check out a comprehensive guide on setting up your Tablo DVR with Roku at this link. It’ll give you all of the information you need! Setting up your Tablo device to work with your Roku is easy – and it’s the best way to get clear, reliable local TV channels on your Roku without having to pay a monthly subscription to streaming internet TV services. There are some other great DVRs on the market, such as AirTV and HDHomeRun, but Tablo has the best Roku integrations and is the easiest to use, making it our top choice if you want to watch local TV channels on Roku using a DVR and an OTA antenna. There are a number of apps you can download from the Roku Store in order to watch local news – completely free of charge. Here is an overview of some of the most useful free Roku apps for local TV channels. NewsOn is a free app for Roku and a number of other devices that allows you to stream local news on Roku, free of charge, from all around the country. You’re not just limited to your own geographical area – you can browse stations from all around the US and pick the one that you want to watch. The service currently has more than 170 TV stations from 108 US markets, and they claim to cover 83% of the US population, with more stations added every year. However, you can only watch news coverage with NewsOn – not local sports or event coverage, or Fox/NBC/ABC/CBS dramas, sitcoms, or other national coverage, so it’s not a perfect solution unless you’re only interested in the evening news. 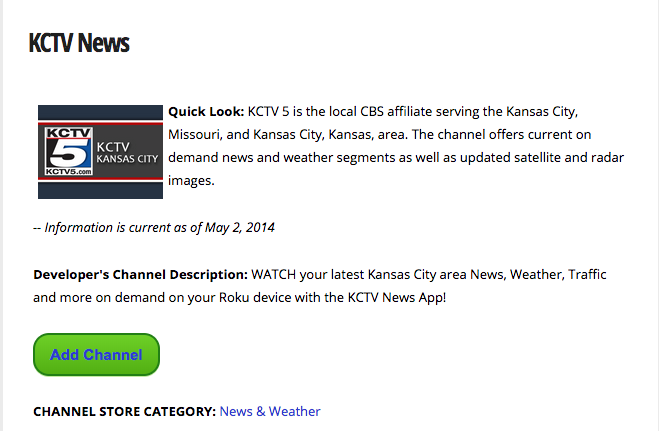 There are many local news stations which have their own apps on the Roku Store. Visit the website of your local ABC, CBS, Fox, or NBC station, and see if they have added their channels to the Roku Store. If you’re only interested in CBS stations, CBS All Access could be a reasonable way to watch local TV Channels on Roku. This service costs around $6 per month. In return, you’ll get up to 10,000 episodes of CBS shows on-demand, as well as live coverage of CBS events nationwide. Live TV is also available in 199 markets. You can see the full list of supported regions at this link. If your local CBS affiliate is on this list, you’ll be able to watch all of the local news, sports, and other content that’s broadcast on the channel.